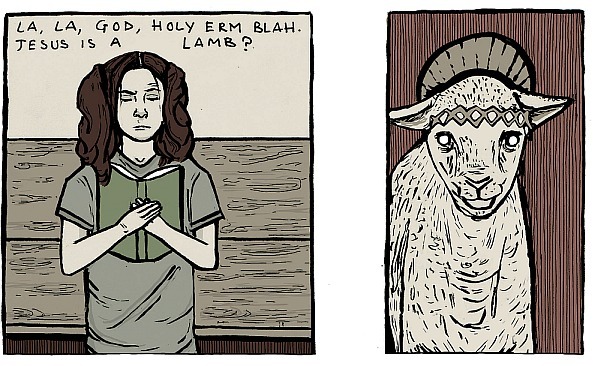 Olivia Sullivan, aka Zen Bucko, has been building up a steady presence on the UK small press scene over the last year or so through both her own projects and her contributions to group publications. 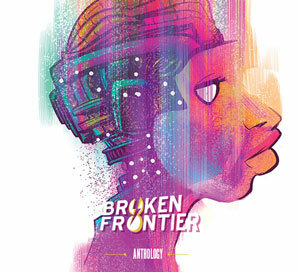 Her early forays into comics were seen last year in the pages of Dirty Rotten Comics, the anthology that has established itself as a platform for new practitioners and experienced names alike. Earlier this year she also self-published The Nose, a comics adaptation and supplement to Nikolai Gogol’s short story in an expansive newspaper format. I Drank Holy Water is her most personal work to date; a diary comic that looks back on her Catholic upbringing and how it affected her early adulthood. Split into three thematic sections – ‘Iconography‘, ‘Side Effects’ and ‘Therapy’ – it compartmentalises her feelings into the inter-related aspects of the retrospective, the consequential and the cathartic. 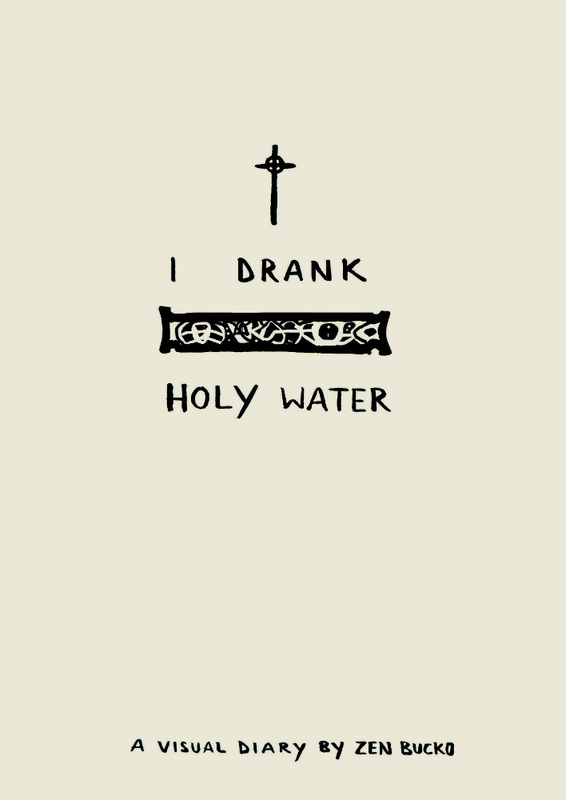 For anyone who remembers their childhood Sundays as a day dreaded for enforced religious observation and the solemn boredom of ceremony then I Drank Holy Water will strike an immediate chord. The book’s first chapter takes us back to that seemingly never-ending Sunday morning ordeal and allows us to see its impenetrable enigmas through younger eyes once again. This first section evokes that peculiar sensation of uneasiness and trepidation that the environs of a supposed sanctuary for love and worship could have on a youthful mind through its disturbing imagery and unchallenged traditions. 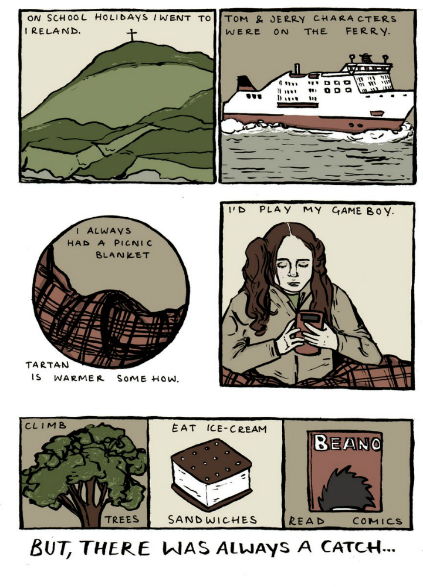 The mystery of the arcane and repetitive rituals perhaps never better summarised than in the panels below. As on-page Olivia goes to extreme measures to avoid the weekly trip to church, her disobedience increases with small acts of stubbornly defiant rebellion that lead into the titular holy water-drinking exploits. These opening pages are constructed to reflect the fragments of memory that they represent; sequential anecdotes interspersed with foreboding single images. As we move into the second section of the book their ramifications in later life become apparent with powerful visual honesty. The effects of the author’s trichotillomania (a subject also covered in Wallis Eates’s zine The Tales of a Trichotillomaniac), for example, are portrayed with little need for accompanying explanatory text. It’s deliberately uncomfortable in its candour, and depicted with an unsettling rawness; guilt and self-image inextricably entangled in doctrine. The final pages erupt into a furious stream-of-consciousness, words and thoughts flowing into each other in an intense and obsessive flurry that is punctuated only by those therapeutic moments of release. Here we flit back and forth from sequential art to graphic narrative as a tentative aura of acceptance slowly creeps to the fore. If such a thing can be said to exist then it could be argued that Zen Bucko’s art has a strangely caricatured realism to it – a distorted verisimilitude that echoes its dark and very personal monologue. Her use of language is equally notable in bringing the reader into her mindset. “It is musty in the church. It smells of dead people. It clings to the hairs in my nose” she recalls in the early sequences. That direct bluntness acting in stark contrast to the lyrical explosion of the final chapter; both mirroring the tone and mood of their respective sections. 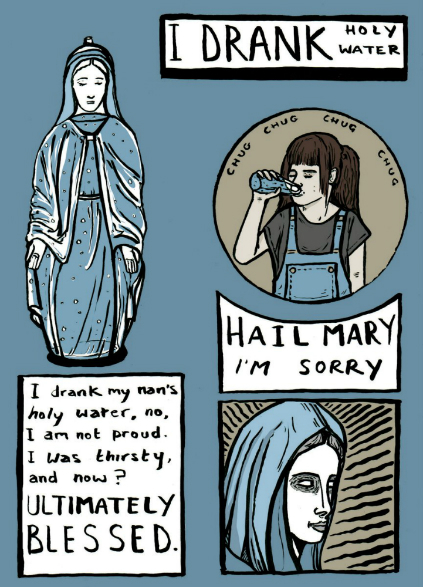 I Drank Holy Water is a fulfilment of that initial promise that was so evident in Olivia Sullivan’s contributions to Dirty Rotten Comics last year. 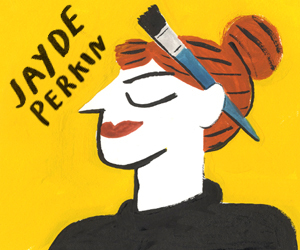 While her work to date has been diverse in the genres it has tackled this book marks her out as a bold and uncompromising new voice in UK autobio comics and, without a doubt, one to keep a very close eye on through the rest of 2016. 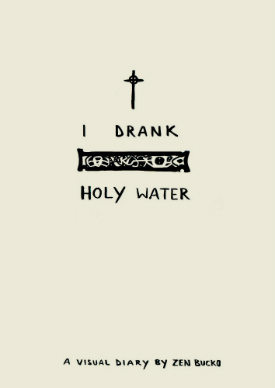 You can order I Drank Holy Water here priced £6.00. For more on the work of Olivia Sullivan/Zen Bucko visit her website here and follow her on Twitter here.